Cattle guards: the most efficient means of containing livestock without a gate. If you have traffic through your pasture or across your fence-line, you know how inconvenient a gate is especially if there are others that need to use it. Not only that, but if someone were to leave the gate open or not latch it closed, you could be looking for and trying to track down your animals days later! The cattle guard was created to allow vehicles to cross through a pasture fence-line without having to rely on opening and successfully closing a gate, however, they do not work with all animals. As we have pointed out in other blog posts, (Cattle Guards can be dangerous to some animals) they are not effective with dogs, goats and sheep and can be especially dangerous to horses. The best and safest means for effectively containing these type of sure-footing animals is a simple gate. : Hoofed animals have a flat surface at the end of their legs to place their weight. This creates discomfort and a problem with balance when attempting to walk on an uneven surface. When placed on a rounded pipe, the hoof will rock forward or backward and create an unstable condition for the animal making it almost impossible for them to balance. If your livestock are brave enough to even attempt venturing a leg on, it will quickly discover how difficult it is to balance. This physical barrier is an extremely successful DETERRENT for many hoofed animals. : The seconded barrier element that a round-finsh cattle guard creates is mental; an optical barrier. Being color blind and having very poor depth perception, the shadows that are projected by the pipe between the rails, amplify the distance and depth between the pipes and will dissuade even the most stubborn or determined animals from thinking about crossing. There have been studies on ‘virtual’ barriers that are no more than lines painted on a road to create the same optical illusion as a cattle guard, but they have been shown to have limited success in keeping cows home. Deer: Deer are another common animal that can be effectively deterred by guards. They are such athletic creatures and are able to jump large distances with little effort that it requires a larger impassable distance be created. To effectively discourage these extreme jumpers, you need to provide at least a 12′ barrier and more commonly a 16′ barrier to prevent them from attempting a jump across. This requires two 8′ guards be bolted together to provide a sixteen foot dimension in the direction of vehicle travel and an effective obstruction. It goes without saying I hope that a fence, tall enough to prevent jumping, be attached to the cattle guard as well. Some animals will not be deterred or have a problem crossing a guard. These are usually the non-hoofed variety with paws. Dogs, cats, coyotes and others will have no trouble getting over the rounded pipes. Even small hoofed animals such as sheep and goats will usually be able to trot right across without much effort. Here, a gate has been shown to be the most effective. The second most requested use we see for these animal deterrents is for the control of horses. We do not recommend that they be used with horses as the horse anatomy has such a slender leg, that it’s hoof can slide down between the pipe until it reaches the bottom of the vault. This traps the leg and exposes it to breaking easily when struggling to get out and can prove to be a devastating. Please use a gate when keeping your horses in a pasture as a cattle guard and a horse leg do not mix well at all. Bison or buffalo, offer a challenge at the other end of the hoof size spectrum. Their hooves are so large, that if the surface pipes are not placed far enough apart, they can get them across the empty space span and create a stable bridge to balance on. It is not an easy task for them, but here too, a gate is recommended for these large animals. Although designed to prevent livestock from crossing, these devises can also pose a dangerous predicament for humans, especially children. The average gap in the piping is usually 3-1/2″ to 4-1/2″ and can be difficult for the human foot to handle when not being especially careful. Because their feet are much smaller then an adults’ and that they may not be as well-suited for balancing on a curved surface, it can be particularly hazardous for a child to cross. While it may be tempting to weld a small strip of metal or attach a board for people to cross, we would again recommend the use of a gate. Even the smallest strip can allow the more sure-footed hoofed animals an escape route out of your pasture. When used in high traffic, or high speed areas, a flat-topped alternative can be used to provide a smoother ride for vehicles. 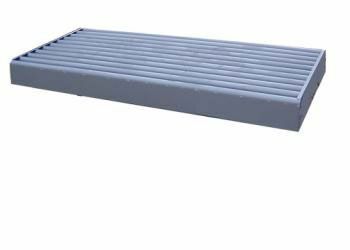 Although not quite as effective a barrier as the round pipe finish, the flat tops allow for an effective livestock control while providing a smoother ride for vehicles. The individual crossing pipes that create the top of the guard are actually a flat topped hexagon that provides a smoother finish for cars and tractors to ride on. They allow easier traversing for human feet while still creating a deterrent for animals. Livestock are not as intimidated by this type of finish, but it can still be effective when properly installed. Cattle guards are an efficient means of protecting and containing your livestock without the use of a gate. They can save considerable inconvenience and provide a reliable way of keeping your animals from harm while providing effortless crossings for vehicles. See Barn World for all your livestock supplies and help with your cattle guard projects. Cattle Guards can be dangerous to some animals. Although they may be the most efficient means of keeping livestock in without a gate, we don’t recommend them for all animals. Horses, may be be most at risk and when attempting to cross a guard. The anatomy of a horses’ leg are such that they may slip down between the pipes forming the top of the guard and in to the vault area underneath. This.will expose the weakest part of their legs to breakage, and once panicked, they can break it quite easily while struggling to get out. For their safety, we only recommend the use of gates with horses. Goats and dogs are immune to cattle guards. These sure-footed animals can simply walk with ease across the top of the pipes. Again, gates are the best option for containment. Deer are extremely athletic creatures. Their ability to jump seems almost effortless as they cross large distances in graceful hops. It becomes necessary to extend the distance of the guard in the direction of travel to deter these animals from attempting cross. A common white tail or mule deer can easily jump an 8 foot distance without any effort at all. These animals require a better deterrent than a cow and and by combining and bolting together two guards, the effective crossing area becomes too daunting even for these creatures. We recommend at least 16 feet in the direction of the vehicle travel to dissuade even the most ambitious jumpers. When considering barriers for deer, it is important to remember that not only can they jump across large distances, but they can also jump over tall fence lines. This will require that the fence line be extended directly to the edge of the cattle guard. With bovine, a set of wings prevent crossings on the shoulders of the roadway, but with deer, a tall fence right to the shoulder will required. You want to prevent jumping across the ends of the fencing. The best use for these barriers is of course with cattle. The traditional round pipe guard has been found to be more effective than the flat top. Flat top finishes allow for smoother vehicle crossings, but the best for livestock have rounded tops. Part of the effectiveness is a visual trick played on the cattle’s depth perception. The shadows created by the round pipe make the crossing look even daunting than it actually is. This in turn creates an even larger mental barrier and dissuades most livestock from even considering a crossing. There are the occasional large bulls that when properly motivated can attempt a 6 foot or sometimes even an 8 foot jump, but these are few and far between. When properly installed with wings, almost all cattle will refrain from even attempting a crossing. Although designed almost exclusively for cattle, these barriers may be also be used for deer, when properly installed. New this year is the ATV guard. Designed for ease of installation, this porable standalone is a great option for fence line crossings for off-road vehicles in remote areas. We have even custom designed these for golf cart crossings of fence lines. Simply make a cut in your fence and drop into place. It couldn’t be easier to install and the built-in rise creates an extremely effective optical and physical barrier. If you have any questions about your cattle guard project, or need any help at all, please don’t hesitate to contact Barn World when planning your installation. We have a wide variety and can offer quotes and bids for any project. Barn World offers several types of cattle guards for private, commercial, public highway and heavy duty offroad equipment use. We comply with city, county, and/or state regulations. Whether it’s called a Texas gate or a cattle guard, Barn World has the variety and selection needed to complete your project. 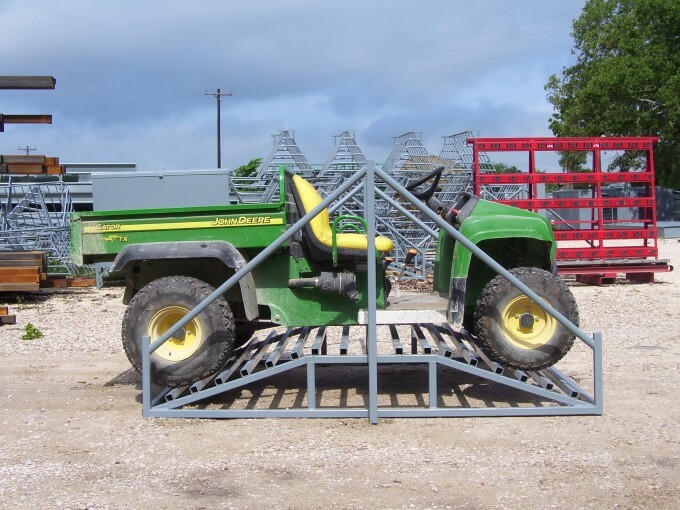 Private use cattle guards are perfect for farm and ranch use and for access areas where the total axle weight is up to 10 tons. 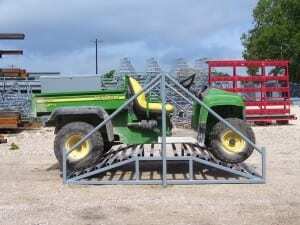 Semi trailers, tractors and large farming equipment are perfect for this type of guard. 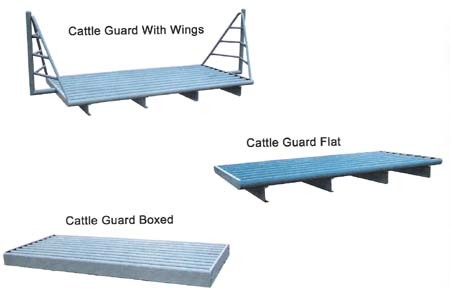 Boxed style cattle guards are designed to sit on flat ground. Gravel underlayment is recommended for drainage of these cattle guards. In many cases these boxed cattle guards are used for wheel washes in construction sites. Flat style cattle guards are designed to be mounted on cement footings. All cattle guards can withstand the weight of full tractor-trailer loads. These cattle guards are constructed with an approximate gap of 4″ between each pipe. Due to availability of pipe, cattle guards will be built with either 9 pieces of 4 1/2″ outside diameter pipe, or 11 pieces of 3 1/2″ outside diameter pipe and are 12-1/2″ tall. There is no difference in strength between the boxed cattle guard and the flat styles of cattle guards. These cattle guards are designed to accommodate full semi loads at 10 tons per axle. Cattle guards weigh about 100 Lbs. per foot (a 10′ cattle guard weighs about 1,000 Lbs.). Add approximately 8 Lbs. per foot for boxed cattle guards and about another 200 Lbs. total for winged cattle guards. To use for deer, you may need to place two cattle guards in tandem so you have 16 feet of protection. Cattle guards are easily bolted together and the extra depth will deter deer. If you prefer, you may order your cattle guards online without the shipping total and we will forward the exact shipping cost for your review via email before processing your order. A very important note: You must have equipment available to unload the cattle guards from the delivery vehicle when it arrives. The delivery truck will require you to unload the cattle guard with a loader or fork lift or some other means upon delivery. Private use cattle guards are NOT built to exact dimensions and sizes may vary slightly. Adding the removable box option will add about 7″ to the total length and width of the cattle guard. For example, a 12 foot cattle guard will be about 12′-7″. For more information on cattle guards, installation or for help with any of your livestock supply needs, please visit www.BarnWorld.com today or call (720) 238-2190 and we’ll be happy to help. Remember, Barn World is y our home for everything from saddle pads, hay feeders, grain bins, mineral feeders and everything to do with livestock. We even carry livestock scales! Picking the right one: When selecting a cattleguard there are a number of things to scratch the old noggin over. For starters, rancher must determine what is the heaviest and the widest pieces of equipment that will ever cross their cattleguard. They then have to look for the cattleguard that will meet those standards. Quality materials and craftsmanship obviously influence the price of a cattleguard, but also determine its longevity as long as the proper load rating is not abused. “The higher the cattleguard (load) rating, the higher the cost. The U-rated guards that are designed for extremely heavy loads are the most expensive. Anytime the distance across a road exceeds 16’, shipping rates can rise dramatically. In terms of cost, it sometimes makes more sense to order two small cattleguards to bolt together in either direction than it does to order one large custom cattleguard,” says Robert Moore with Barn World, LLC in Parker, CO. Ranchers must decide if a flat or box type cattleguard works better in their environment and whether they prefer square or round rungs. Flat style cattleguards are placed over a dug out cement vault, whereas box style cattleguards basically have a built in vault and sit close to the top of the ground. Placement: Cattleguard placement varies because of different soil conditions, climates, drainage, and intended uses. Barn World suggests ranchers have a local contractor, who is familiar with the area, set the more permanent types of cattleguards. Installation for these cattleguards typically involves digging a one foot deep trench that is one foot wider than the cattleguard. Six inch wide walls should then be poured around all four sides to prevent dirt from collapsing in. In the bottom of the trench, a 12” wide and 18” deep footer is needed under each beam of the cattleguard. It is critical that the cattleguard sits on footers that are sufficient to support the full load of traffic. Ranchers must keep in mind that the vault does not support a cattleguard in any way. While setting a cattleguard, installing large PVC pipe through the forms or digging out and adding gravel will help with drainage issues. Box cattleguards typically do not need a vault. Their box formation keeps dirt from working into the guard. “One of the biggest mistakes folks make is setting their (box style) cattleguard at ground level. You have to hold them slightly above grade and ramp up to and away from them to prevent them from filling in. Limitations: Jones warns people that before they are sold on the idea of a cattleguard, they must be aware of their limitations. He finds that cattleguards typically do not work to separate cows from their calves or cycling cows from bulls. They also have a hard time holding cows without water from water and cows without feed from feed. Jones discourages ranchers from putting cattleguards in corners or along the edge of an alleyway where cattle can easily crowd them. A peek at what these boys have to offer: Powder River: www.powderriver.com Powder River cattleguards are made out of structural steel, have square cross rails, and are either powder coated green or painted yellow. These cattleguards are designed to meet the American Association of State Highway Transportation Officials (AASHTO) specifications. 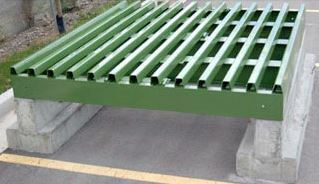 Powder River builds a wide range of cattle guards with the strongest built to handle up to 30 tons per axle. Powder River cattleguards are available in 8’, 10’, 12’ and 14’ road lengths and 7’5’’ and 8’ widths. Powder River offers an optional three rail clean out section on all of their models except the U-80’s. Wings, steel posts, and pre-cast concrete bases are also available. Powder River stands behind its cattleguards with a five-year warranty. Barn World: www.barnworld.com Barn World offers rated, standard, and basic boxed and flat style cattleguards. Their rated cattleguards are intended for highways or for heavy off-road equipment. They are available with certified load ratings of H-15, H-20, U-54, and U-80. Barn World also offers an HS20 rated cattleguard to meet State and Federal requirements. Certified structural steel is used in the manufacture of all Barn World HS20 rated cattleguards. Barn World’s line of standard cattleguards are made with new .113 walled steel pipe, and like all Barn World cattleguards, come with a gray enamel finish. Their basic cattleguards are made of a heavy duty structural .188 walled pipe with diameters of 3.5” or 4.5”. Barn World now offers a cattleguard design specifically for ATVs. These ATV cattleguards are made of 1.5 x 11 gauge square tubing and are 72” wide by 91” long. The overall width of these guards including their wings is 87”. A 14” ramp on each side allows them to be set on top of the ground and eliminates the need for a vault. Barn World is strictly an Internet-based business. With three cattleguard manufacturing plants across the United States, Barn World strives to keep shipping costs at a minimum. JE Hill Precast: www.jehillprecast.com JE Hill Precast concrete cattleguards feature rounded top rails and built-in footers that eliminate the need to pour concrete. These cattle guards simply sit on top of the ground and are best positioned so they are held slightly above grade with a gravel ramp on both sides. They come in 12’, 14’, and 16’ road spans and all measure 6’6’’ across. JE Hill Precast’s standard cattleguards have a 72,000 pound gross vehicle weight (GVW) limit, while the heavy duty models have greater than a 90,000 pound GVW limit. These cattleguards weigh from 5,000 to 7,000 pounds depending on their size. JE Hill Precast cattleguards are designed so they require no additional construction, can be installed in two hours or less, and can easily be relocated. Creep feeders: Barn World’s large creep feeder selection is now available. 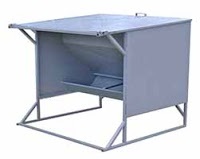 Barn World offers a large selection of creep feeders for all your livestock needs. We even have creep feeders for your stalls. 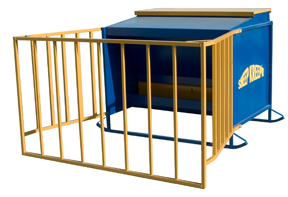 For all of our creep feeders, please visit Barn World.com today or call (720) 238-2190. Creep feeding will have your calves ready for market sooner in high quality condition. Creep feeding also assures less strain on your brood stock. Healthy brood stock means better quality calves year after year. Nutrition is the key to successful wildlife and game management. And nothing is more important than protein. Protein is absolutely essential to the health of your entire herd and to the potential for trophy bucks. Whitetail deer need protein all year round, especially after the rut and during the critical 200-day antler-growing period. Protein feeding is the ideal complement to natural forage. 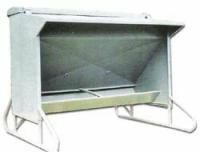 Barn World carries a large selection of creep feeders, both large and small. To see the full line up of feeders, please visit Barn World today or call (720) 238-2190.